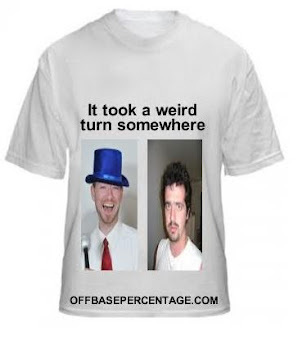 Off Base Percentage: Why Does Everybody Hate Chase Utley? I've made it abundantly clear over my months of writing here and the years at Monkeys Throwing Darts that I am an unabashed Chase Utley fan. It continues to baffle me why he doesn't get more MVP love every season. Even more baffling, Utley has zero Gold Gloves compared to Derek Jeter's five. Brandon Phillips was solid by all accounts at second base this year. So it's not as an erroneous error as giving Jeter another Gold Glove over, oh say, me at short stop in the AL. But Utley was yet again the best fielding second baseman in the National League. As you all should know by now, defensive metrics are still in the works but we've at least advanced past the point where just looking at errors and fielding percentage gives us any kind of accurate portrayal of positional efficiency. I'm going to go ahead and pretend that Utley didn't get the Gold Glove this year because he only played in 115 games otherwise I'll give myself a stroke. In case you were wondering, Utley was also the best second baseman in 2009 (11.2 UZR) and 2008 (18.4). And on another note, Skip Schumaker plays second base as well as I play poker when I'm drunk. I throw things everywhere and rarely make the right play.